This is Part 17 of a 47-part series of occasional blog posts looking at curries from each of Japan’s 47 prefectures. Fukushima Prefecture has a long history of recovering from geological disasters. Some of those disasters can be remembered through local curries. Since the latest and most terrible of these disasters – the 2011 earthquake, tsunami, nuclear meltdown and mass evacuation – I have visited the prefecture at least four times. No, I didn’t visit the ruined nuclear power plant. But as I will explain further down in this post, knowledge of its existence didn’t deter me from eating several local curries. Two of those curries are marketed with images of fire. The first curry commemorates the July 15, 1888, eruption of Mt. Bandai, a volcano near the center of the 13,780-square-kilometer prefecture. The mountain had been a smooth, Fuji-like cone before it suddenly exploded due to a buildup of underground steam. 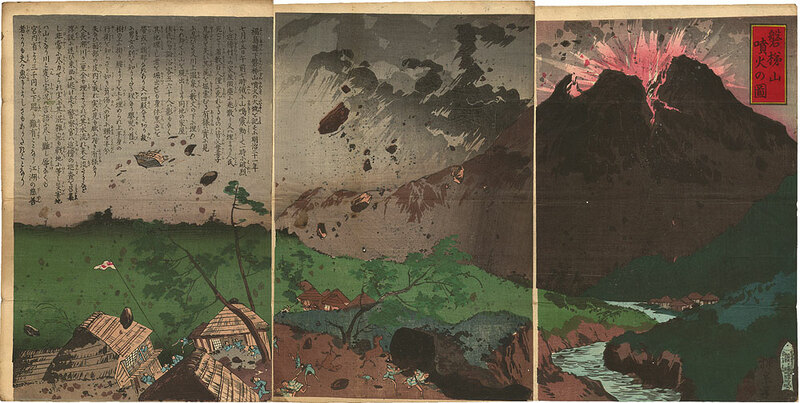 The blast – which went largely sideways rather than up, similar to the explosion of Mt. St. Helens in the United States a century later – left behind an irregularly shaped mountain with four separate peaks. According to the Japan Meteorological Agency, the explosion could be heard from a distance of 50 to 100 kilometers, an avalanche of debris buried five towns and 11 villages, and ash fell from the sky along the coast of the Pacific Ocean, about 90 kilometers away. At least 461 people died. Did I say there’s a curry that commemorates this event? Perhaps I should have said there’s a curry that cashes in on it. The design on the box of “Mt. Bandai Great Eruption Curry” is not exactly reverent. But I bought it in a souvenir shop at the foot of the still-active volcano. The people who live and work in such an area are entitled to a bit of gallows humor, especially more than a century later. 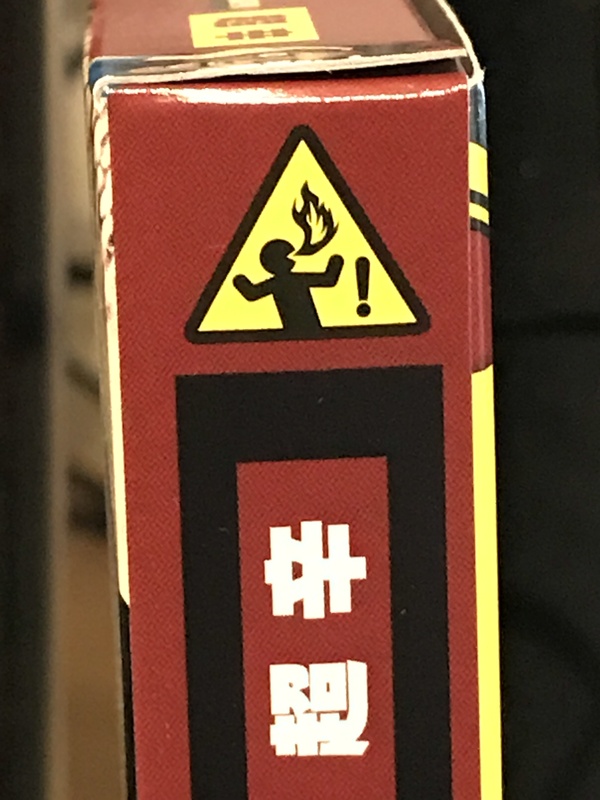 The back of the box includes warnings that children, pregnant women, and those with weak stomachs or high blood pressure should eat this lava-like curry with caution, if at all. So naturally, I was expecting something super-hot. As it says on the label: 超辛 chou-kara. Unfortunately, all I can say about this curry is that it was hot. It wasn’t pleasantly peppery, like Kagawa Prefecture’s olive curry. Nor was it masochistically thrilling, like Miyazaki Prefecture’s jet-fuel curry. It was just plain hot. I was disappointed by its lack of complexity, but if simple hotness is what you’re after, this curry is for you. The next disaster occurred in the late 1960s. The coal mining industry in Iwaki, a coastal city in the southeast corner of the prefecture, had gone into decline due to Japan’s growing use of oil. The local mining company tried to diversify into tourism. It created a hot spring resort called the Joban Hawaiian Center, now Spa Resort Hawaiians. 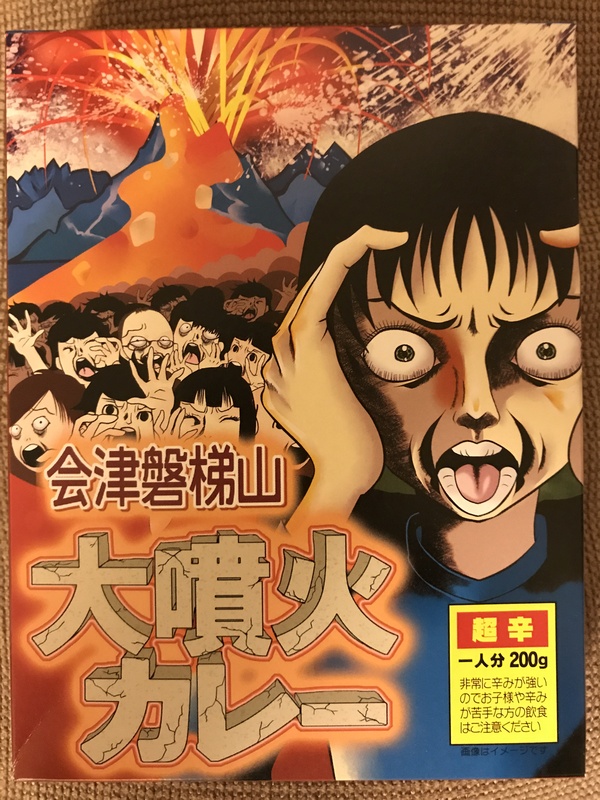 According to a Yomiuri Shimbun interview with an executive of the resort, disaster ironically struck when the mine then hit an underground body of water and flooded, forcing it to shut down a decade ahead of schedule. Everyone knows about the third big disaster – or set of disasters – to hit Fukushima Prefecture. On March 11, 2011, a huge earthquake set off a massive tsunami that ravaged the coast, killed thousands of people, and damaged the Fukushima No. 1 power plant, leading to meltdowns in three of its reactors. The meltdowns prompted large-scale evacuations that themselves have been blamed for many additional deaths. In addition to the cost in human lives, the tsunami devastated local economies up and down the coast – but especially in Fukushima, where fears of radiation kept tourists away and drove down sales of agricultural products. About two years after the disaster, I made a minor contribution to the prefecture’s economic recovery by visiting Spa Resort Hawaiians. I soaked in a large rotenburo outdoor bath, I went down the many water slides again and again (a feat made possible by the lines still being so short at that time because people were staying away) and of course I took in the hula show. I was pleased to see that the hula girls are now joined by hula boys, who stunt-dance with flaming torches. Finally, I bought omiyage souvenirs to bring back to Tokyo and share with my coworkers. This is standard etiquette for Japanese travelers, and omiyage is almost always some edible specialty from the place you visited. But would my coworkers want to eat food from Fukushima? And could I be sure that it was safe enough for me to offer it to them with a clear conscience? There was a lot of doubt in the air at that time, so I split the difference and picked up a couple of boxes of Hawaiian Host chocolate-covered macadamia nuts. They clearly weren’t made in Fukushima, but at least I was leaving some money in Fukushima to get them. Since then, I have become much more sanguine about food from Fukushima. I’ve been following the news, and I have yet to read even one credible report of any dangerously radioactive food reaching the retail market. Not one. Moreover, Japan’s standards about radioactivity in food are now ridiculously strict. To look at it another way, the following chart from Japan’s Consumer Affairs Agency shows that eating a whole kilogram of food with cesium at the 100-becquerel level would expose you to less than 2 percent of the radiation you’d get just by sitting in an airplane on a flight from Tokyo to New York. So, just as I am not afraid to eat spicy food, I am not afraid to eat food from Fukushima. When I came across some Hula Girl curry at a Fukushima antenna shop in Tokyo recently, I didn’t hesitate to buy it and try it. 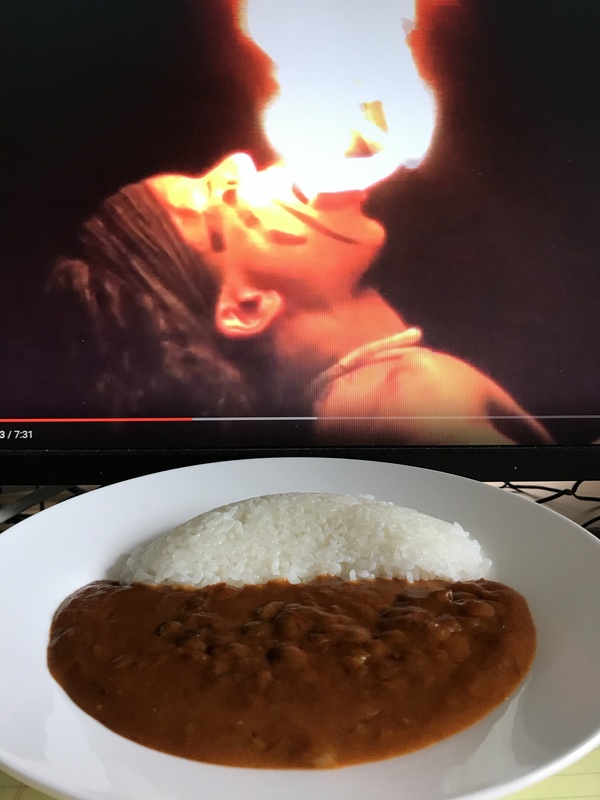 I’m happy to report that the “fire beef” curry, with a torch-twirling hula boy in the corner of the box, is much more interesting to ingest than the Bandai lava curry. This curry is quite hot, but with more varied flavors also making themselves known. It’s tomatoey with faint hints of fruit. It’s hotness seemed jalapeno-esque, with a little sweetness to it, even though jalapenos are not on the ingredient list. The ingredients begin with beef (ground, rather than the chunks I’d hoped for, but it’s definitely in there), followed by onions, flour, curry roux, sugar, tomato paste, salt, curry powder, onion powder, beef extract, togarashi hot pepper, coconut milk powder, mango chutney, pineapple puree, garlic, and garam masala, ending with the usual inescapable colorings and such. Good stuff, over all. Dancing with a flaming torch is scary. Eating Fukushima curry is not. This entry was posted on August 24, 2017 at 10:22 pm and is filed under Curry, Food, Sightseeing. You can follow any responses to this entry through the RSS 2.0 feed. You can leave a response, or trackback from your own site. Hurrah…So great to read another in the curry series…I thought the journey was over!